I have a number of completely random fears about getting our service dog in August but the most recent actually deals with our beagle, Maizy. Last time I checked beagles were a type of hound; you know a dog commonly used for hunting. I’m assuming that also means very comfortable with loud noises since I don’t know many hunters who use silencers to hunt. Maizy has been perfecting a fear of storms over the last few years. This fear now extends to heavy rain, wind, and now any loud noise. It seems that our neighborhood celebrates fireworks season as poppers and other random loud noise producing items have been quite popular for the last 2 weeks. This has meant that our otherwise sedentary dog has taken to wanting inside, outside, inside, outside, inside, outside repeatedly for hours at a time. She also has been trying to climb furniture like the cats do and when all else fails she pants and paces and pants and paces and pants and paces. If this is annoying you, try spending the day at our house. So I’ve been waking up at night wondering if Maizy is going to teach this fear of everything to the service dog. A scared service dog trying to escape noise tethered to my son ….so many things wrong with that picture (for starters have you met my son….noise should be his middle name). I mean I’ve imagined our dogs’ stupidity driving the well trained really expensive dog to run off into the sunset in search of higher life forms but in those images the dog was never tied to my son and it certainly wasn’t over noise. We’ve already maxed out the doggy xanax so it’s time to get creative. A friend suggested a product called the Thundershirt. Ironically the vest is essentially a weighted pressure vest for dogs and the website even references Temple Grandin’s work as well as the use of weighted blankets in children with autism. Now this is interesting because we have a very cool, very unused CARS weighted blanket that is hanging over Caden’s rocking chair in his room because he didn’t like it no matter how many times or ways we introduced it to him. So I started to wonder if we can cut a hole in the blanket, add some Velcro, and we’d have a “re-purposed” doggy sensory blanket. Now granted I think it has beans or something in it so the hole would be a problem but nothing a little glue or tape (notice I didn’t mention anything about sewing) couldn’t take care of. I figure Caden and Maizy are pretty close in weight so that shouldn’t be an issue either. How hard can this really be (anyone else humming the theme song to “You might be a redneck if…..?”)……….I mean really? I proposed the idea to my husband who merely said just order the Thundershirt and I will tomorrow if I can find the measuring tape to measure the dog. For some reason we don't quite know, Caden's facebook group has disappeared. We are hoping it will magically appear as quickly as it disappeared but rest assured if it’s gone for good, we will recreate it bigger and better with your help of course! American writer Jessamyn West stated, “A taste for irony has kept more hearts from breaking than a sense of humor for it takes irony to appreciate the joke which is on oneself.” Some days it is only recognizing the irony of living with autism that keeps us from hunting down a really large rock to crawl under. Autism is never funny, but when you live with it day in and day out recognizing, appreciating, and even laughing at the irony is about the best coping mechanism we’ve found. 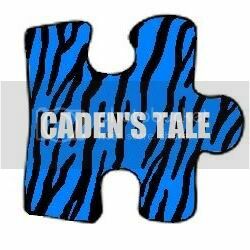 Caden, like many children with autism, also has a sensory processing disorder. In a nutshell, his perceptions and senses get mixed up a lot. He hears, sees, feels, tastes, and smells everything quite differently. So he has had difficulty with baths for awhile now. We have tried baths, showers, special showe heads, different temperatures of water, an array of toys to make the experience more fun but although he has no problem stepping into the bath tub he absolutely can’t stand for the water to get on him. Bath tub plus water equals a meltdown but……..water coming from the sprinkler outside or pouring down rain isn’t a problem. So we need to either figure out how to wash and rinse in the back yard without our neighbors flipping out or we need to figure out how to add an indoor water park to our house----guess which option our daughter is hoping for? We have worked really hard to teaching Caden how to count and when he got the hang of it, his understanding of numbers just kind of exploded. We were thrilled when he could count to ten, and then 20, and then 50, and then 100 and then 1000 and then….oh did I mention repetitive behaviors are also a huge part of Caden’s autism? We decided we would enjoy his counting no matter how many times an hour he decided to count. We were equally thrilled when he started pointing out numbers everywhere we went—he could not only count but also recognize numbers! This was a breakthrough of epic proportions. But then there was the day when he discovered house numbers and became mad at the world because the numbers weren’t in order. 403 wasn’t right, it should have been 034 and no amount of explanation would comfort him. Leaving our house became a meltdown because not even our own house number was “right.” This is where the irony of it all comes in. You have to appreciate the meltdown….the tears and dismay…..because he recognized the numbers weren’t in order. To dismiss that recognition would be to dismiss a huge accomplishment; at 4 our baby can count by 1s, 2s, 5s, 10s, and even 20s to 1000, he can recognize numbers, and he understands order. But the world doesn’t exactly come with that kind of order, does it? See we are right back to the irony of it all. Then there’s the feeding aversion. From birth Caden could tell the difference between powdered formula and premixed liquid formula, fruits and vegetables aren’t his friend, he won’t go near anything sticky, and he’d prefer brown foods. He loves bread, waffles, pancakes, bagels, rolls, or pasta. One well meaning occupational therapist thought hiding food was a good idea; he went on a 2 week eating strike. A pediatrician tried sending him to an eating disorders clinic—he was 3, was primarily nonverbal and they wrote him a referral to a talk therapist----seriously? We recently met with a nutritionist for suggestions---after we pointed out he is allergic to soy, carrots, and most vitamin supplements that we have tried, can’t drink milk products, that we are vegetarian, and that he won’t drink anything that was originally powdered, she wished us luck as she walked us at the door. The poor woman gave us her card but you could see the fear in her eyes----she is terrified that we’ll call to make a follow-up appointment. Recently though Caden has added a new favorite to his diet and there’s color like you read about in all the magazines: orange and red to be exact! No doubt very, very early in the morning I’m sure that Caden will be asking for a cheese slice with ketchup on a hotdog bun for breakfast. And the IRONY continues…..